Beaker - A beaker is a glass container with a flat bottom and a small spout for pouring. It is used in the chemistry lab for mixing, heating, and stirring liquids. 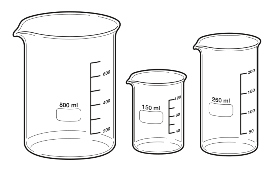 Beakers come in various sizes and are shaped like a cylinder. Bunsen burner - The Bunsen burner is a metal tube that produces a flame from gas such as methane, propane, or butane. It is used in the lab for heating and sterilizing. The Bunsen burner is named after German chemist Robert Bunsen. Crucible - Crucibles are containers used for heating substances to very high temperatures. They are generally made from materials such as porcelain, nickel, and alumina. Erlenmeyer flask - This is a type of chemistry flask with a conical shaped body, a cylindrically shaped neck, and a flat bottom. It generally has measurement marks on the side. It is similar to a beaker, but has the cone shaped body. The cone shape reduces losses from evaporation and helps to prevent spills when stirring the liquid. Funnel - A funnel is a pipe with a wide mouth that helps to pour substances into a container without spilling. In a chemistry lab, funnels are often used together with filters to separate a mixture. 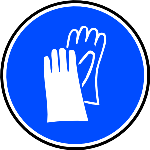 Gloves - Laboratory gloves are important to wear in order to protect the skin from chemical substances. Always listen to your teacher and make sure to wear gloves when performing experiments. Goggles - Goggles are very important when performing experiments of any kind. 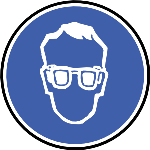 They can keep dangerous chemicals and other substances from damaging your eyes. Always wear your goggles in the lab! Graduated cylinder - A tall skinny cylinder used to measure volumes. It is generally a more accurate way to measure volume than a typical beaker or flask. 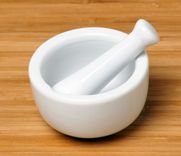 Mortar and pestle - A mortar and pestle are used to crush and grind solids into a powder. The mortar is a bowl and the pestle is a small club-shaped tool. They are typically made from ceramic or stone. Pipette - A narrow glass tube used to transfer liquids from one place to another. Pipettes sometimes are used for measurement. The accuracy of different pipettes varies widely. Scoopula - A scoopula is a metal spatula-type utensil used to scoop up solids such as powders in a chemistry lab. Stirring rod - A skinny solid glass rod used in chemistry to mix chemicals and liquids. A stirring rod is typically about the length of a long straw and has rounded ends. 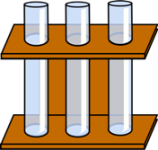 Test tube - A test tube is a glass or plastic tube used for holding, mixing, and heating small quantities of liquid chemicals. Test tubes often have a flared top to help with pouring. They come in a variety of sizes. Test tube holder - A stand built for holding multiple test tubes. Test tube brush - A brush designed to help clean out test tubes. Test tube clamps - Clamps that hold test tubes while using them to heat up chemicals during a lab experiment. Thermometer - A device used for measuring the temperature of a substance. Triangle - A triangle made of clay pipes and wire that can withstand high temperatures. It is often used to hold a crucible. Wire gauze - A wire gauze is used to support a beaker or flask when heating. The wire gauze helps to spread the heat evenly.